The Seimas started to examine the Law on National Minorities, however because of the end of time allocated to this law the chairman of the meeting Algirdas Sysas proposed to extend the deliberations on Thursday. The critics of the law argued that it might be unconstitutional and asked whether such a law is necessary at all, because the rights of the citizens are enshrined in the Constitution and other legal acts. “Are we in need of such a law at all? This are the questions also asked by the jurists noting that most of the current rights of the national minorities are integrated into specific laws and a separate law is not necessary” said a conservative Valentinas Stundys who emphasised that Lithuania ratified the Framework Convention for the Protection of National Minorities that main assumptions are taken from the national law. “The core of the draft is undoubtedly public writings and validation of multilingualism in certain parts of Lithuania Are those proposals consistent with the Constitution and Law on State Language? Article 14 of the Constitution unequivocally provides for the Lithuanian language as the state language and the Constitutional Court through a couple of its rulings extended the doctrine of the national statute of the Lithuanian language” argued Stundys. A conservative Vida Marija Čigriejienė noted that “in Lithuania nobody forbids one to chose their nationality, maintain their culture, language, religion, promote their ideas in the local language during elections, set up organisations and protect their heritage”. “Throughout centuries Karaites, Tatars, Ukrainians, Russians, Jews, Belarusians have lived in our country, maintained their culture, for all of them the Constitution provides for equal rights. I cannot understand why do the Poles identify themselves as a national minority, although according to the Framework Convention for the Protection of National Minorities they are not one, because the Vilnius Region is not a Polish ethnic territory but one that is densely inhabited by citizens using the Slavic language” said Čigriejienė. A liberal Dalia Kuodytė accentuates that the draft law is not meeting the legal requirements. „The draft law can be called a manual to Polish plates. I would advise not to make a comedy out of it, not to offend other minorities, but to demand of the government to do its work and to prepare a draft consistent with the Constitution” said Kuodytė. 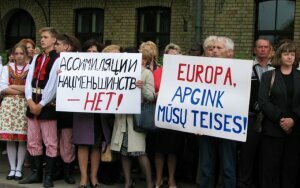 The draft was defended by the representatives of Electoral Action in Lithuania. “When the previous law was valid Lithuania became a member of the European Union and NATO and for this we should give three orders to Vytautasowi Landsbergisowi. We must learn the democracy from the US. They also have writings, but what is the most curious and distressing is that beyond the eastern border where the brutal autocracy prevails and where there is no democracy, they also have bilingual writings. I am sad, I cannot understand why while we are a democratic country we are so far behind the dictatorial ones” said Zbigniew Jedziński. On the other hand Jarosław Narkiewicz, the vice chairman of the Seimas stated that “the community is negative towards national minorities and their needs and they try to assimilate the Polish minority”.